Crowdfunding has been growing substantially and billions of euros have been raised through the crowd. Yet, the cultural and creative sectors (CCS) are not very familiar with this new funding tool. In order to better understand and evaluate the potential of crowdfunding for creatives and cultural organisations, the European Commission launched Crowdfunding4Culture. What actions should public authorities take in order to raise awareness, create trust, train and link creative communities in using crowdfunding? These actions, targeting crowdfunding platforms and cultural organisations as well as local, regional and EU policy makers, aim to improve the understanding and uptake of crowdfunding for cultural projects. Sign up now (discussion closes at 31.03.2017) and help shape the future use of Crowdfunding! Organisations that support creatives and cultural entrepreneurs should update their current guidance & toolkits and events to incorporate the topic of crowdfunding, its multifaceted benefits (community building, audience development etc…) and risks. In promoting access to finance for the CCS, local, regional and European policy makers should integrate information on crowdfunding (models, VAT, tax, platform costs etc...), its potential and risks. The EC should facilitate the exchange of practices and lessons learned on policy initiatives on crowdfunding and matchfunding between local and regional policy makers (e.g. through the Open Method of Coordination mechanism). The EC should further develop the Crowdfunding4Culture.eu website as a tool to raise awareness on the potential of crowdfunding in CCS, by sharing examples (both successful and unsuccessful) on 1) the use of crowdfunding and its different models for all CCS, and 2) setting up partnerships to support crowdfunding for CCS. The EC should support the launch of an EU wide CCS crowdfunding prize competition to stimulate and showcase innovative and impactful uses of crowdfunding in the CCS. The EC should facilitate a European conference on crowdfunding 4 culture on a yearly basis, creating a platform of exchange between cultural organisations, platforms, investors, philanthropy organisations like European Cultural foundation, and policy makers. The EC should stimulate the process of setting up a European quality label for crowdfunding platforms to be initiated by the CCS crowdfunding community. Member States and the EC should provide clear VAT and Tax guidelines for crowdfunding campaigns in the sector. Government/regional and EC should support incubator type of places where people come together and develop skills on how to get started with crowdfunding. Member States should integrate financial literacy at an early stage in curricula during formal education. The EC should support the development of an access 2 finance tool (similar to the one aimed at start-ups) that provides an integrated overview for the CCS actors on the various sources of finance and the potential financial mix, including crowdfunding. 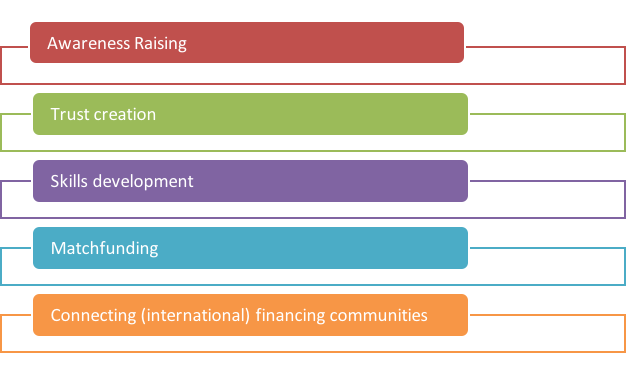 Similar to the Capacity Building programme of the CCS Guarantee Facility, public authorities should facilitate the development of training programmes for financiers and crowdfunding platforms on the specifics of crowdfunding cultural and creative activities. The EC should further develop the Crowdfunding4Culture.eu website as a tool for skills developement, through 1) the regular update of the resource repository page and 2) the development of a “How to run a crowdfunding campaign” toolkit tailored to the different creative sectors and crowdfunding models.